“23 Things They Don’t Tell You About Capitalism” is written by Ha-Joon Chang, a Professor of Economics at the University of Cambridge and author of other economics-oriented bestsellers like “Bad Samaritans”. “23 Things” is a book critiquing free-market capitalism. Ha-Joon Chang questions basic assumptions we take for granted and gives us a new and original perspective into the problems caused by this version of capitalism. Ha-Joon is also careful to point out that while he thinks capitalism is still the best economic system invented, it is free-market capitalism he is against. 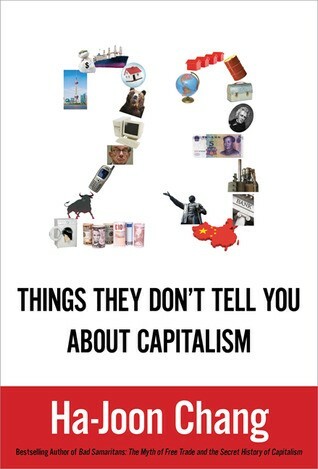 “23 Things They Don’t Tell You About Capitalism” has 24 chapters; 23 of which are the “things” with the 24th on moving away from the mess created by free market capitalism. These 23 things question the efficient market hypothesis and the neo-liberal economic policies which have become popular in the ’70s and ‘80s. Each “Thing” starts with an explanation of what we are told it is and then what it actually is. This is followed by numerous sections with anecdotes, statistics and Ha-Joon’s analysis of why there have been failures and successes. Each thing is relatively independent of the other and can be read in such a manner. In addition, the book has listed out 7 different ways of reading this book depending on your intent. These ways range from understanding capitalism to why some people are richer than others. “23 Things” is an eye-opener. There are many assumptions I have made, given I have been indoctrinated through my education and media about the efficacy of capitalism. Ha-Joon’s evisceration of these assumptions made me question what I thought I knew. This is a book on macroeconomics and while the author has kept his explanations simple, there are places where some knowledge of advanced economic theory would be useful. Ha-Joon has done a great job of explaining these topics as well. He is truly global in his outlook and it is refreshing to see a non-WEIRD (Western Educated Industrial Rich Democratic) perspective of the world. I liked the organization of the book along with the multiple recommended ways to read it too. “23 Things” can get a bit statistics heavy in certain sections. In some places, I was not sure if it was his opinion seeping through or if it was backed by research. But such instances are rare. I liked the book. While the reasoning in some chapters is dubious, the fact that the assumption is being questioned makes it worthwhile. My takeaway from this book is that the IMF and the western world have been forcing a lot of faulty policies on the weaker developing nations for last few decades. These policies are also affecting the weaker economic classes even in the western nations. These nations have gone through their own protectionist, non-free market cycles in their past which are partially responsible for their economics strength (in addition to colonialism). These very nations are now forcing the rest of the world to not do as they did, but to do as they are told. The reader can judge whether this is due to maliciousness or incompetence. I strongly recommend reading this book, especially if you are someone who has been bought thinking that capitalism will solve the world’s ills. I would suggest “A Little History of Economics” as an optional read before this (review).